Internet Marketing Tactics, Tips and Reviews by Henry Zeng » The Best Spinner Review & Discount – $47 Speical Offer! Indeed, content is your best investment for your online enterprise. But original content is rarely cheap. Often, online marketers have to pay around $5 to $15 for a 400 word article. One solution is to use some article rewriter software to rewrite the total article and make it unique. I’ve personally used some “article rewriter” software, which just “automatically” generate some junk articles that not even readable. I also paid $197 for David Watson’s Website Content Wizard, and it’s not even half as good as Best Spinner. And with the growing popularity of the Best Spinner, more and more 3rd Party Tools are supporting the Best Spinner API, which makes the Best Spinner a must-have for every serious online marketer. So How Is The Best Spinner DIFFERENT? The Best Spinner software will drastically reduce the amount of time needed to rewrite and produce 100s of unique version of your articles. And some of the features provided are not being offered by any other software or service at the time I’m writing this post. Best Spinner has the BEST built-in thesaurus that with hundreds of thousands of entries added by REAL users writing real-world articles. 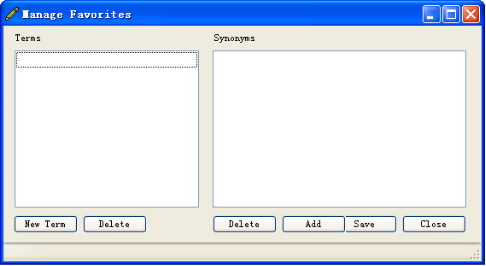 The thesaurus updates constantly as the thousands of users work in the system – the more people use the software, the better the thesaurus will be. However, there is one problem. It’s possible that the thesaurus can be filled with random, unrelated words overtime by certain users, with or without intention. The good news is you avoid this by only selecting the “good synonyms” or “best synonyms” when you spin your articles. Good synonyms and best synonyms are ranked based on how often a certain synonym is used. More people use a particular synonym, the higher it is ranked as being a relevant word. In this way, you can avoid using the irrelevant material that filled in the thesaurus. Then you press “tab” button in your keyboard and it opens up a box for you to choose the synonyms you want. 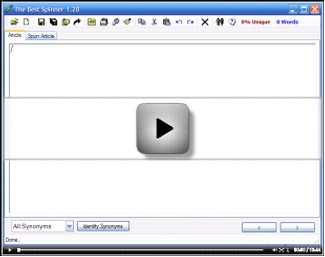 Selecting the spinnable words is just one-click operation. Everything designed is put there to be fast. After you are done, you can use the arrow buttons in the box to move forwards or backwards. If you are a keyboard person like me, you can also hit “tab” to jump through the words and phrases, or “shift tab” to go backwards. You can also save your most frequently used synonyms as favorites. This is another very powerful feature because you can instantly apply all your stored favorites. I use TBS mainly to spin articles for UniqueArticleWizard submissions, to get massive traffic to my websites. As you see in the screenshot, Best Spinner has built-in export format for UAW. 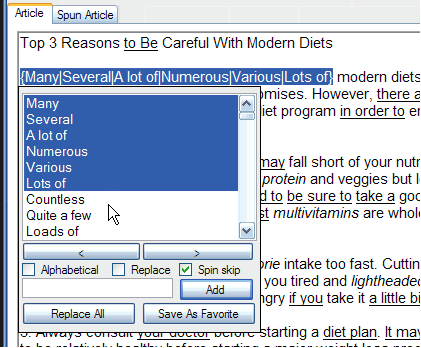 You can also easily customize the spin formats so that it can export the articles to fit any program. It IS the best spinner out there, if you need a tool to instantly “recycle” or add on to your existing content for more leverage. It works well for rewriting PLR articles. The Best Spinner will help you to spin and create hundreds of articles in a record time, and get the most out of content for your profit. Great review on the best spinner. Having this function in any article submission software is important because you do not want duplicate content getting sent out all over the place. I use a similar software and swear by spinning my articles. Thanks for sharing. If I did not already use one I would definitely pick this up. Great Review. The Best Spinner is a great piece of software. The updates are released continuously. I’m using it with good results. Highly recommend it! One problem that I have recently had is that it takes more than 5 seconds when you click “Replace all”. I hope it will be fixed soon. I actually haven’t tried Best Spinner yet. I haven’t gotten to the point of needing a piece of software like this yet either. Will definitely keep it in the back of my mind. Nice description of the software though and the images are clear. Thanks for the review! Ive tried best spinner and it works for me great! It is a great tool to spin your article for creating another unique article. What a good review on TBS; however, there’s a software that maybe better than thebestspinner thats web based. The software is called Content Professor at http://www.contentprofessor.com . You should check that out . I’ve been checking out Best Spinner for quite some time now and I see now that it’s one of the BEST if not the best one out there.. I will check in on this for sure.. I was DISSAPPOINTED with “The best spinner” results. It took me ONE HOUR PER PAGE to correct the mess from the “crazy spin”. If I had done it manually it would only be 10 minutes. PLUS, my pc is OUT OF ORDER since this morning. SO, it’s no good for any scientific work. When using spinners you should defiantly stay away from the auto spinning buttons. To get a good quality article that you can use to promote your site you really do have to manually spin to stand any chance of getting some link juice and Google love. However…There is a way to do things on auto, well sort of here’s a little tip. As an alternative to The Best Spinners auto spin function I use Spin Rewriter because this spinner breaks the rules and actually spins articles perfectly on auto, I think it’s the only one that can do this. Anyway so I auto spin with that then I would use The Best Spinner to go over the article and manually spin words – this way I can get a decently spun article but take some of the work out with an second spinner. Hope this was somewhat useful and gives some people a few ideas. I have created a review of Spin rewriter it’s a work in progress so don’t be too harsh.